Kendo, "the way of the sword", is the art of Japanese fencing. The goal of modern Kendo is to foster self-confidence, build strong spirit and character, respect for oneself and for others, as well as increase one's physical fitness. This is all accomplished through the discipline and etiquette of training in the martial arts. 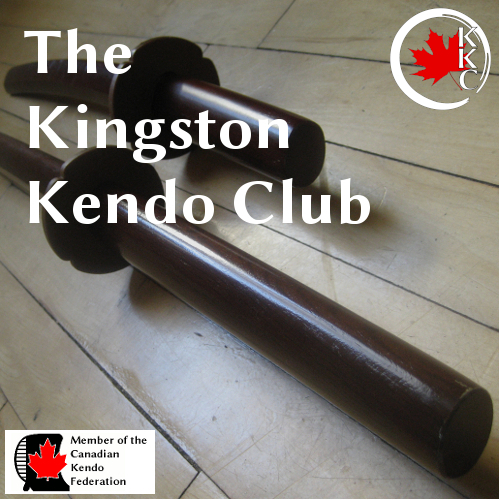 The Kingston Kendo Club is the first Canadian Kendo Federation sponsored Kendo club to open in Kingston, and is open to all members of the community. Men and women throughout the world practice Kendo together at all levels of skill and we hope to continue this by attracting members from all different age groups and backgrounds. I apologize for the lack of updates. Classes are cancelled this week Tuesday, Apr. 9th, and Thursday, Apr. 11th, as the gym will be in use for the school's annual school play. Also, class will be cancelled next week, Apr. 16th, due to another event being held in the gym. (1) As a reminder class wil lbe cancelled on Thursday, Oct 25 due to an event at the school. (2) The Kendo Glossary found on the website has been updated. This version is the one which will be found in the club's updated kata booklet. You can download the glossary here. (1) Classes will be cancelled on Thu, Oct 4 and Sat Oct 6. (2) Class will be cancedlled on Sat Oct 13 due to the upcoming Kendo Ontario seminar. Class will be cancelled Thursday, Sep 27 due to school events in the gymnasium. Regular classes will resume starting on Tuesday, Sep. 4th, following our regular schedule. Due to gym renovations our official practices have ended until September. Unofficial practices will be held outdoors during the summer on a "To Be Announced" basis. These classes will be announced via e-mail and through the FB group. Classes will be cancelled on Jun 12, 14, and 16. Class will be cancelled tonight, Mar 1. Class will be cancelled tonight, Feb 27. Sorry for the inconvenience, but I'll see you all Thursday. Class will be cancelled today to avoid spreading around this bug I seem to have. See you all next week. I apologise to everyone for all of the cancellations of late, but classes will have to be cancelled again this Thursday, Jan. 25 and Saturday, Jan. 27th due to being ill.
Due to the nasty weather, we'll play it safe and cancel class tonight, Tuesday, Jan. 23. I apologize to those who showed up on Saturday, Jan. 20th; classes had to be cancelled due to illness. If you are not on the club e-mail list, or in the club facebook group you will have missed the announcement. Please send an e-mail to the club and I will add you to the list or join the FB group. Our classes will resume for 2018 this Tuesday, Jan 6th. The updated version of the club dojo manual is now available.